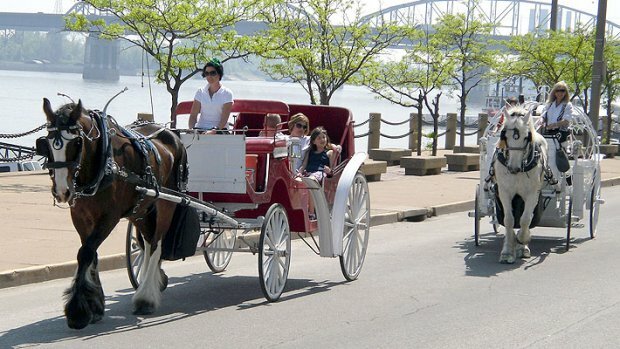 ST. LOUIS, Mo.--Teenage boys on bicycles robbed two female drivers of horse-drawn carriages Sunday morning, reports CBS St. Louis. In each incident, five or six boys surrounded the carriage, nearly knocking the driver off of it while grabbing her purse, says Jerry Kirk, the owner of the Brookdale Farms carriage company. Kirk says the ordeal is very unusual. "We've been there seven nights a week for 35 years and never had an issue with anything," Kirk says. "This is the first time that we've ever had an incident this way, and I'm not aware that there's ever been an incident like this ever before." Police arrested one suspect Sunday night, and another was arrested on Monday, allegedly while trying to sell a carriage driver's stolen cell phone at a nearby mall.